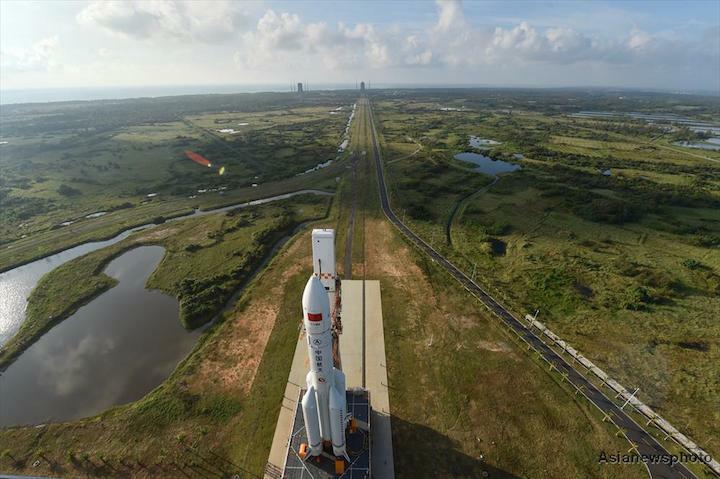 China could almost double its record for space launches in a year in 2018, with the main space program contractor aiming for 35 launches and additional missions planned by emerging commercial actors. The ambitious target reflects multiple expanding space programs, a growing commercial space sector and a backlog from 2017. The China Aerospace Science and Technology Corporation (CASC), announced at a conference on January 2 that its 2018 work model includes 35 launches, underlining the return to flight of the heavy-lift Long March 5rocket, the Chang'e-4 lunar far side mission and launches of Beidou navigation satellites as the major activities. In addition CASIC, a defence contractor, missile maker and sister company of CASC, will carry out a number of missions through its subsidiary EXPACE, including launching four Kuaizhou-1A rockets within one week and the maiden flight of the larger Kuaizhou-11. Landspace Technology, a Beijing-based private aerospace company, is also expected to debut its LandSpace-1 solid propellant rocket this year. China aimed for around 30 launchesin 2017, but two launch issues - notably the failure of the second Long March 5 rocket - halted activities for 89 days. China closed the year with 18 launches - including 16 from CASC - down from a national record 22 in 2016. In 2017 the United States topped the launch tables with 29 (all successful), with Russia second on 20 (19 successful), with China third (1 partial failure, 1 failure). The Chang'e-4 mission will be the first attempt to soft-land on the far side of the Moon, and involves first sending a relay orbiter to a Lagrange point beyond the Moon, set to launch in May or June 2018. The Chang’e-4 lander and rover, which was manufactured at the same time as the Chang’e-3 mission which put the Yutu (Jade Rabbit) rover on the Moon, is scheduled to launch around half a year later, in November or December. As well as the gains in international prestige, the mission promises serious scientific returns, landing within the South Pole–Aitken basin, a huge crater that may include lunar mantle excavated by the impact that formed it and thus offer unique insights into the interior of the Moon, what is made of, and how it formed. The mission also includes a biology experiment involving a mini ecosystem containing silkworm eggs and potato seeds, pioneering astronomy tests, and involvement from Sweden, the Netherlands, Germany and Saudi Arabia. The Long March 5, which successfully debuted in November 2016, is by far China's largest and most powerful launch vehicle, and is capable of launching interplanetary missions, lifting huge satellites, with a variant being developed to launch modules of the future Chinese Space Station to low Earth orbit. However, the second flight of the Long March 5 on July 2 failed due to an apparent first stage propulsion issue, delaying the Chang'e-5 lunar sample return mission, which was scheduled for November 2017. No details of the launch failure investigation nor the return to flight mission were revealed, but there are indications that it will involve the large Dongfanghong-5 (DFH-5) satellite bus, the first of which, Shijian-18, was lost with the failed July launch. While a launch of Chang'e-5 late in the year was not explicitly ruled out, the omission of information on the mission suggests it will take place in 2019. There was also no mention of debut of the Long March 5B for low Earth orbit missions, which remains a possibility for either 2018 or 2019. China's space activities are typically opaque, with missions sometimes becoming apparent only days before launch, and with no prior official announcement. Expected launches for 2018 include more than 10 Beidou GNSS satellites - China's answer to GPS of the US - including a number of dual satellite launches to medium Earth orbits. China had aimed for 6-8 such satellites to be launched in 2017, but a partial failure of the Long March 3B rocket in June dented these plans. A number of satellites for the Haiyang (ocean observation), Fengyun (weather), Yaogan (remote sensing and/or reconnaissance), Gaofen and Ziyuan (Earth observation) and Zhongxing (telecommunications) satellite series will be launched, as well as satellites for Egypt, Saudi Arabia, Pakistan and Sri Lanka, and commercial companies GomSpace, Satellogic, Changguang (Jilin), SpaceTY, Kepler Communications, SuperView (Gaojing) and others. Science missions Zhangheng-1, also known as China Seismo-Electromagnetic Satellite (CSES) with Italian involvement, and the China-France Oceanography Satellite (CFOSAT) are expected to launch in February and the second half of the year respectively. All four of China's launch sites,- Jiuquan, Taiyuan, Xichang and the new Wenchang coastal complex - will be in action, with the latter to see Long March 5 and Long March 7 launches. In addition, CASC will attempt its first sea launch in 2018, using a Long March 11 solid rocket and a modified freighter.